I recently attended the launch of the all-new 2016 Lexus RX in Portland, Oregon, where I discovered a new way the federal government is keeping down the little guy: by standing in the way of turn signal coolness. Yes, ladies and gentlemen, that’s right: today I’m going to talk about turn signals. And by God, you’re going to listen, because what the hell else are you going to do? Go back to work? But first, a little backstory. My recent interest in turn signals began last week, when I was driving the new RX at the new RX launch in a convoy of other new RXs. We were cruising down the street, just like normal, when suddenly I was hit with love at first lane change. There it was: the new RX’s turn signal. And it wasn’t a regular ol’ halogen bulb or a blinky light, like normal cars have. It was this fluidic design that moved with the grace of a ballet dancer wafting across the stage at an Upper East Side charity event where they serve six meal courses, none of which are larger than a regulation USB stick. As we drove past the RX, I noticed the very same design in front. I was smitten. So a few miles up the road, we decided to stop our RX and get some pictures before it started raining. When you’re in Portland, this is a very real concern, because it rains all the time. You could be walking around in the sun, and BOOM! The rain starts. You could be walking around at night, and BOOM! The rain starts. You could be sitting inside, and BOOM! The rain starts. This last one may be an indication that you are sitting inside the shower. So we’re taking photos of the RX, and I decide to turn on the indicator to get some shots of that sweet, sweet turn signal design. And that’s when I see it: a standard halogen bulb. A normal blinky light. A regular, boring turn signal. The futuristic look is gone; disappeared; replaced by a standard turn indicator; a dinosaur from the pre-Lexus RX Turn Signal Era that had begun about 14 minutes earlier. Initially, I assured myself that this was OK. We’re just driving the RX 350, I thought. Maybe the turn signal is only on the nicest models, or the RX 450h. So we returned to the staging area, and I went over and pressed the turn signal on the RX 450h. Nothing. The RX 350 F-Sport. Nothing. The RX 450h F-Sport. Still nothing. And then, as I was standing there and mulling the turn signal situation, it happened: one of the predator grilles chewed off my ankle. No, I’m just kidding. What actually happened was I went inside and asked one of the Lexus people about the turn signal situation, and they told me that U.S. government regulations don’t allow for the cool turn signals, so we would have to make do with regular old boring turn signals instead. That one with the fancy signals? It turned out to be a Euro-spec car on hand for foreign journalists. 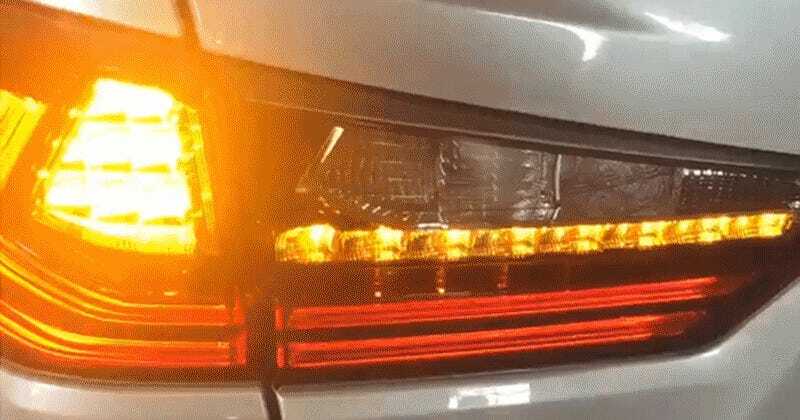 Yes, ladies and gentlemen, that’s right: this excellent turn signal; this bright, beautiful expanding arrow that leaves no question about exactly where the RX is going to go (slowly, in the left lane), is not allowed by our federal government’s turn signal regulations. Instead, we get a cheap little Halogen bulb that looks like the kind of thing Casio would use as a backlight for a watch they sell at Target. So why, you might ask, is the Lexus RX barred from having this wonderful turn signal, when the Ford Mustang gets away with a similar design? To find out, I decided to peruse the United States Department of Transportation’s Federal Motor Vehicle Safety Standards for lamps and associated equipment. (PDF here) Unfortunately, this document must conform to the Federal Standards for Document Longness, which means it is 731 pages in length. I made it to approximately page four. This is about where everyone gives up when it comes to reading government documents. Fortunately, thanks to the miracle of modern science, there is a “find” function, and I was able to look up the exact regulations on turn signals. And here’s what I learned: all turn signals must be at least 2,200 square millimeters in size. Do you believe that? 2,200 square millimeters! TWENTY-TWO HUNDRED! TWO THOUSAND, TWO HUNDRED! This is as big as a… well, actually, I wasn’t sure what it was as big as, so I got out a ruler and I measured. It turns out it isn’t very big. So how does the RX’s turn signal not qualify? I mean, the damn thing lights up, and lights up more, and lights up more, and then at the end it lights up most, like a turn signal doing its very best impression of a firework. Well, according to the Lexus people, the problem is this: the 2,200 square millimeter measurement doesn’t apply to the turn signal as a whole, but rather every single little bulb that lights up in a row. So while the Mustang’s signals get a pass because each segment of that turn signal is larger than 2,200 square millimeters, most of the RX’s segments are smaller. The result is that RX customers in foreign markets get the cool, graceful, fluidic turn signal, while we Americans are stuck with regular old crap. That’s the bad news. The good news is that there’s a presidential election coming up, which means we can finally rid ourselves of the failed Obama and Bush administrations and elect someone who can take a serious look at these Federal Motor Vehicle Safety Standards and make major changes. My vote goes to whoever can stay awake past page four.